Jessying - Malaysia Beauty Blog - Skin Care reviews, Make Up reviews and latest beauty news in town! 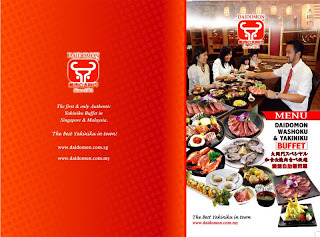 : Restaurant review : Daidomon Japanese BBQ Buffet! 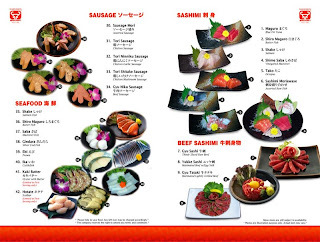 Restaurant review : Daidomon Japanese BBQ Buffet! 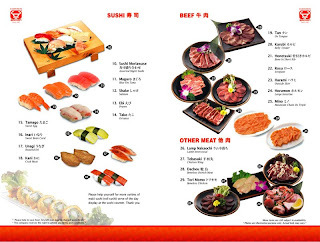 The menu offers unlimited fresh food such as seafood, poultry, vegetable, sushi and other stuffs for you to order ( except for scallop&oyster) and there are a sushi bar, and2 buffet line offering fried rice with some dishes which you need to get it yourself. 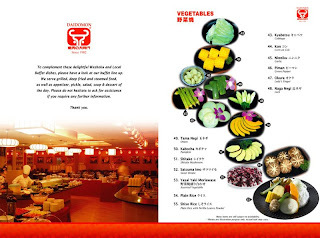 And there are 3 types of soups, Miso, Vege and Tail Ox availabe. 5 types of juices available at the drinking station (orange,mango, sourpalm and the best of all is blackcurrant!!) Also we can order a pot of green tea without any charges!!! Additional RM1/person for misc items such as chopsticks. Overall -8/10 stars ( Must try!!!! I will definately go back!) - How I wish its not a halal restaurant!!!!!!!!!! Note : Pls made your reservation before going there! BBQ... the marinated ladyfingers taste super yummy!!!! I like the chicken meat the because the marinating sauce and the chicken complement very well! I like to play masak-masak! The fresh seafood, Butter fish, Salmon, Prawn and Cuttlefish! Octopus!!! I have taken like for 5 plates of this. The purple light in this picture, is the electronic charcoal stove! Very clean and healthy! *p/s:definitely it is a Japanese restaurant, the shop sign and the lanterns inside d rest were written in japan word la. I will try the restaurant in korean village soon... heheh wait for my review ba.. u give me money to try then i help u to see if its worth to go..